Do offensive moments trigger growth? People make me sick. I guess it’s just been one of those days. You know the kind where people make blatantly offensive comments…the kind that are hard to ignore. The kind that make you question your conception of life. I strongly dislike these days, but I wonder if they’re necessary for growth. I’m not sure if it’s even worth repeating the ideologies I found offensive—after all you may not think they’re offensive at all. 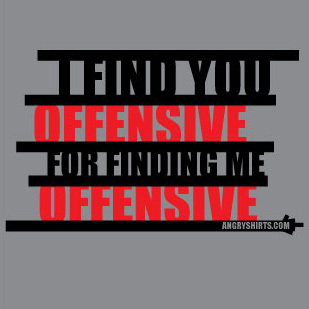 The point is that they were offensive to me, so just imagine someone said something offensive to you. Did you imagine it? Okay, so what is the best way to proceed? Should we discuss it with the person who offended us, keep it to ourselves, discuss it with a friend, tweet about it, or discuss it with someone we look up to? I tried the latter, but it didn’t help…le sigh. I feel as though I’m in a state of cognitive dissonance. I believe everyone is entitled to their own opinion but I think some opinions are just flat out wrong. I want to pretend people don’t think that way and surround myself with people who don’t, but this would be limiting myself to a state of ignorance. Viewpoints contrary to my own are essential to my intellectual and emotional growth and one day I will be grateful that I was offended today. Somehow, some way the offensive moment will expand my conception of life experiences—I just wish it didn’t make me lose some of my faith in the human spirit today. ← Who am I in 250 words (or less)?